Welcome to this week’s United States Road Trip lesson on Ohio! Ohio became the 17th state on March 1, 1803. It has been nicknamed “The Buckeye State” due to the dense forests of buckeye trees that were once found in the state. Cleveland, OH is the home of the Rock and Roll Hall of Fame. It is dedicated to archiving the history of some of the best-known and most influential artists, producers, engineers and others who have influenced the music industry through the rock genre. Canton is home of the Pro Football Hall of Fame. 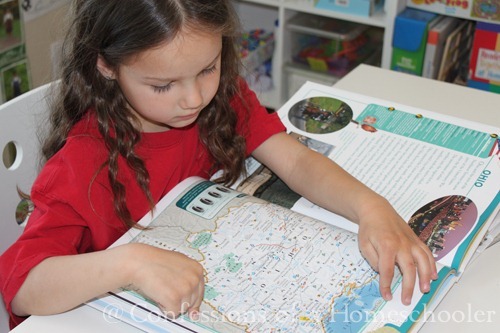 Read our National Geographic Atlas and located Columbus, OH using the map coordinates. 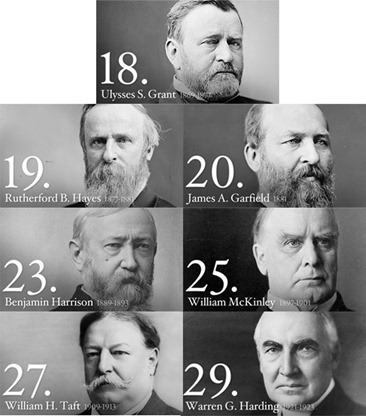 U.S. Presidents: Seven United States Presidents were born in Ohio, see below for details. 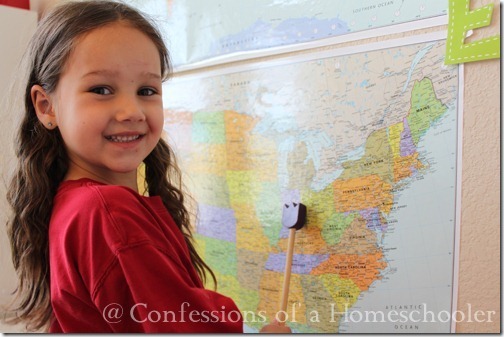 Then Tinker Bell had the honors of adding the state to our wall map. They all took turns locating Columbus, Ohio in our National Geographic Atlas using the mapping coordinates. I like that they get this well enough now. Instead of me telling them the coordinates, they’ve also started finding the capital city on their own, then telling me what the coordinates should be. It’s good editing for my Road Trip USA curriculum! 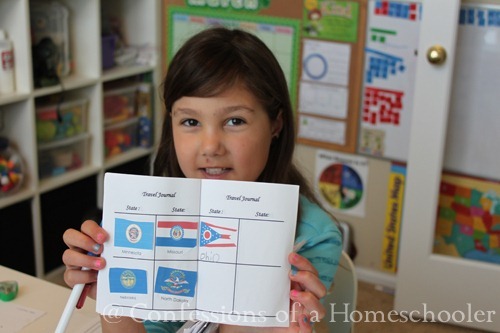 Strawberry Shortcake was kind enough to add Ohio to our United States Bulletin. After that we reviewed all of the states we’ve learned so far on our travels. 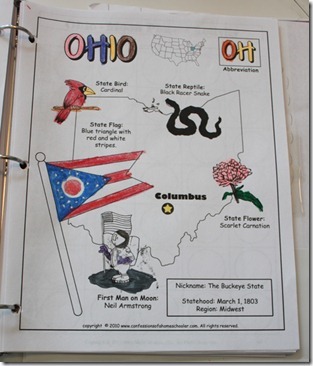 Of course the kids had a chance to color in their state worksheets as we read through all of our information for Ohio . 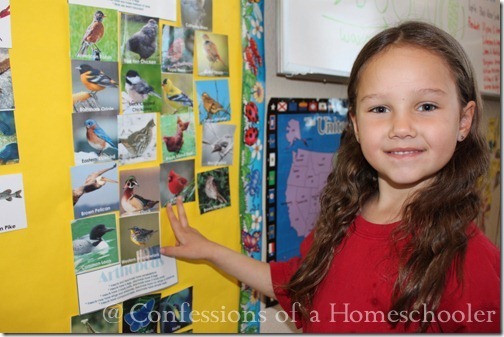 After learning about the animals symbols for Ohio , we classified and added the animals to our USA animal wall! 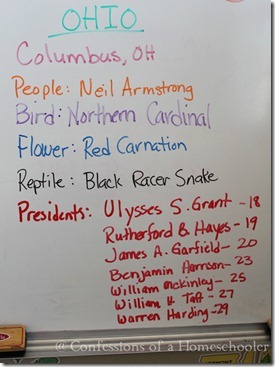 US Presidents: Seven United States Presidents were born in Ohio. Ulysses S. Grant (18th, 1869-1877), Rutherford B. Hayes (19th, 1877-1881), James A. Garfield (20th 1881, his presidency lasted only 200 days from March 4, 1881 until his death on September 19, 1881, from an assassin’s bullet fired July 2, 1881), Benjamin Harrison (23rd, 1889-1893), William McKinley (25th, 1897-1901), William H. Taft (27th, 1909-1913), and Warren G. Harding (29th, 1921-1923). 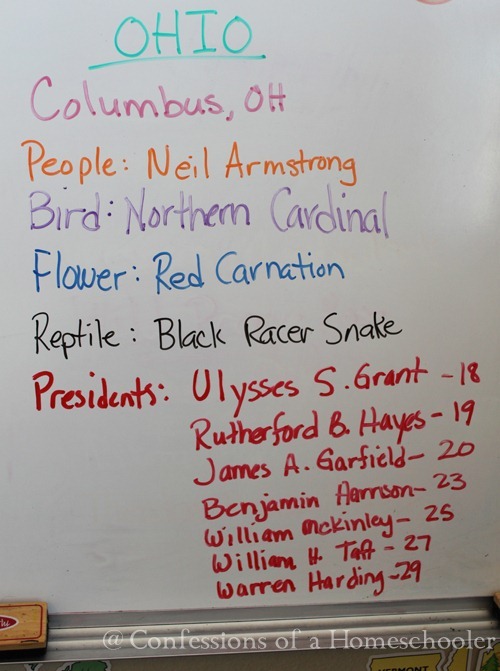 Famous People: Neil Armstrong was born in Wapakoneta, OH on August 5, 1930. He is a former American astronaut, test pilot, university professor, and U.S. Naval Aviator. He is most well known as the first person to set foot on the Moon. 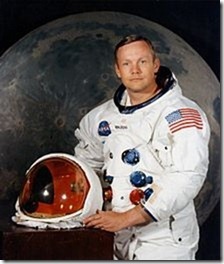 On July 20, 1969 Armstrong served as mission commander of Apollo 11, the first manned lunar landing in history. Armstrong and Buzz Aldrin descended to the lunar surface and spent 2.5 hours exploring. 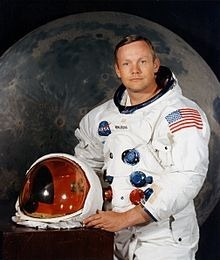 He is recipient of the Congressional Space Medal of Honor. 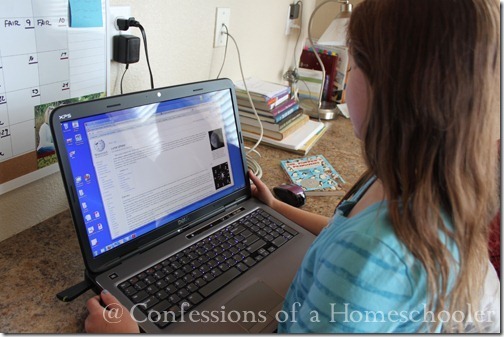 We also worked on a phases of the moon activity in honor of Neil Armstrong. We kept a month long record of the moon in all of it’s different phases. I think the kiddos liked this one just because they got to stay up late! Strawberry Shortcake did a little reading on the phases of the moon for us before we started our chart. 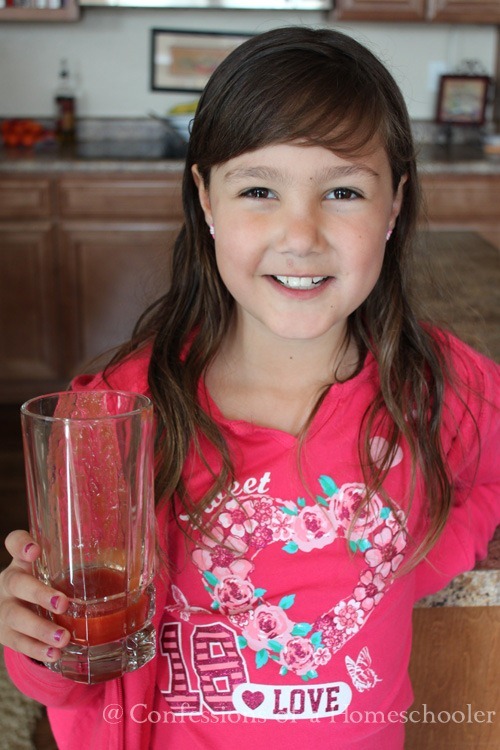 We all sampled tomato juice, Strawberry Shortcake was the only one out of all four kiddos who actually liked it. And that ended our journey in Ohio , we sealed the deal by adding the state flag to our Travel Journal. And that wraps up our Ohio study! If you’d like to come along with us on our Road Trip USA journey, click the image below to learn more! 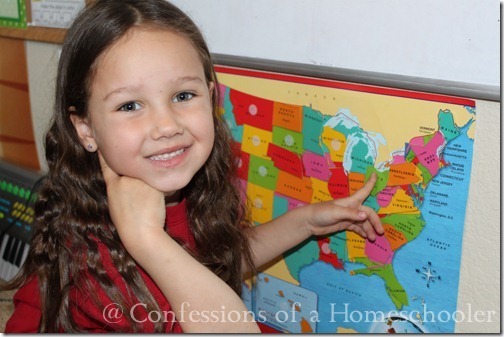 So excited that I found a set of those bulletin board separate states (that you use, but that are out of print) at a used home school curriculum sale for only $2 bucks! Yippie! SCORE! The only thing missing is a buckeye! Awesome overview of *my* state! Just curious if you take a Summer break? Or do you homeschool year round?